Hmm, yea I used Geographic Exploration System again in one of my posts. Once you start using the term you can’t stop (kinda like “consume web services”). 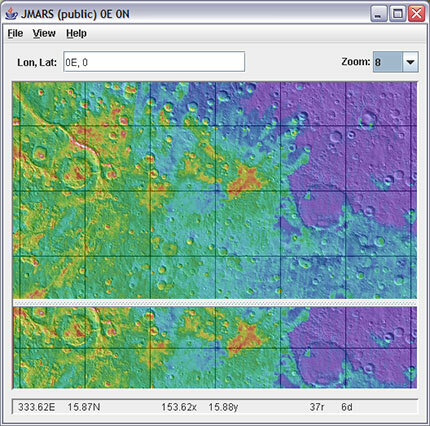 Well beyond all that I saw that Arizona State University has a Java program called JMARS (Java Mission-planning and Analysis for Remote Sensing) which “provides easy access to many different Mars data sets, including MOC, MOLA and THEMIS, and allows the user to combine these into a single image”. JMARS supports Java Web Start so you can launch right from your web browser. In typical Java frustration though it requires J2SE 1.4.2 and of course I had 1.5.x only. Once you get that figured out is a really impressive way to view raster information from Mars. One really interesting feature is that new datasets are constantly being added to JMARS because the Mars Odyssey spacecraft is still taking THEMIS pictures of the surface. You can also load shapefiles, GML or even ASCII (assuming you have such files for Mars).